Happy Valentine's Day! In honor of today's cheesy holiday, I am wearing red. This dress is from Studio M, and I have had it for a few years. Since I bought it back in 2008, I think, I couldn't find the dress online, but here is a similar dress with the same silhouette and flutter sleeves. It comes in four colors, including red, and is on sale for $70 at Macys.com! What a deal! Although it's not the best dress to wear to work -- it is not really that professional -- it will have to do. I didn't have anything else left that was Valentine appropriate, and I wanted to look nice since I am meeting my own Valentine for lunch today. Can you believe today marks the 11th Valentine's Day we have spent together? I am actually not the biggest fan of this holiday. Back in high school and college, I felt like the holiday just served to remind me that I did not have a boyfriend. Even now that I do have a Valentine, although it's nice to get a card or gift, I just don't need a specific date set aside to tell my husband how much I love him. Hopefully I do that everyday. 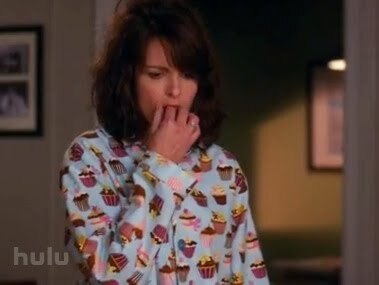 Chapin also got me these non-flannel cupcake pajamas I have been lusting after ever since I saw them on an episode of 30 Rock (one of our favorite shows). Chapin and I decided a long time ago that we would not go out every Valentine's Day... All the restaurants are so expensive on this day, and since we go out to eat a lot, there's not really much point. We also don't like to leave George alone at night after he's been alone at home all day. So Chapin is going to make dinner for us tonight, and we will have a nice evening just the two of us (and George, of course). I hope you enjoy today as well!